Today’s story teller is the creator of Japan’s most popular hero anime series “Anpanman”, [W:Takashi Yanase]. He is now age of 90. It’s been 40 years since Anmanpan was born and still it’s popular among Japanese young Children. Anpanman is well known as anime series, but it was originally children books. When Yanase was about 60 years old, he started wanting to write children’s books of Anpanman that he had been writing as magazine comics. The idea was from his war experience, and these beliefs were engraved on his heart. After brooding over a character who saves poverty people, he reached Anpanman because Anpan (a sweet bun filled with red bean paste) is a popular sweet snack, and its cute round shape is perfect for the character. The hero Anpanman’s face is made of anpan, so he gives his face to starving people but when his face is eaten or get wet, he gets weak. Besides, he doesn’t have exceptional power like other superhero from the beginning. This is how Anpanman became children’s books but people’s reactions were unfavorable. 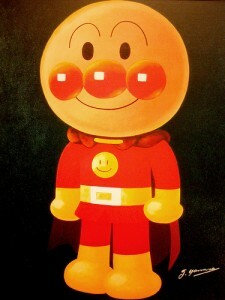 Opposite to his thought, Anpanman got popular, and more characters were born one after another. You can see how popular it got in the children’s books, the TV anime series, the films and the related goods.